And since my blog had always came to my rescue in the past, I decided to focus on it. But I didn't know how to take the next step and take it to the next level. I love blogging and writing and playing about fashion and beauty but I wanted more and I didn't know how to get it. So I turned to Sarah Arrow and Sark E-Media for help. 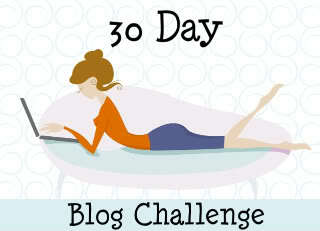 Sarah suggested to start a 30 Day Blogging Challenge. I had to write one post every day for 30 days! For a girl like me that uploads a new post once a week (sometimes less) it sounded impossible. But I accepted the challenge because I wanted to push myself into becoming a better blogger and step out of my comfort zone. At the beggining, everything went smoothly... I had all my posts very well organized and every day Sarah sent me emails with blogging tips and exciting challenges. Unfortunately, I usually read her emails on the bus or in the tube while I was going to work and it was hard to keep up. But the challenge was going well the first 20 days and Sarah was extremely supportive. But the last 10 days were a struggle... Trying to keep up with work issues, with personal issues, with blogging... It got too much too handle... But I finally made it!! It might took me more than 30 days to complete the challenge, but here I am! Challenge completed!! And I'm extremely happy!! This challenge taught me a lot about blogging and about myself. Thank you Sarah for your support! !